When leases first came out as an option to get a new car it was commonly said that this is throwing money away. “You’re renting it” was a common phrase said to those leaning towards leasing. Much of this has to be done with the generations before hand who were told to own and keep everything. While there is some truth to holding onto somethings for the long run you really need to consider what makes most sense for you. Especially when it comes to you and your finances. No More Repair Bills – When you lease a car you never have to worry about paying for major car repairs. Leases cover engines, transmissions, or any other major mechanical mishaps. All you are responsible for is maintenance items like oil changes and tire rotations. Unless you pop a tire you’ll be turning in the lease before new tires or breaks are needed. Get A Car Based On Your Needs – It’s true you can buy any car at anytime but doesn’t it seem your car needs change every two or three years? Cheaper Than Buying – Lease payments are always going to be less than car payments. Most car loans are 5 years. Take a $30,000 car over 5 years and with a 0% interest rate. If you bought the car you would pay $500 a month. A lease payment would be around $350 saving you $150 a month. This way you can keep your money and invest it. If you really like the car at the end then you can buy the remaining balance out right. Easier Approval – It is usually easier to get approved on a lease than on a loan. The car manufacturers need to get somebody else paying down the balance on the loan and are willing to loosen their guidelines more than a bank because they need to make a sale. A bank sees you as a risk because they are giving you money to buy something that will be worth less the second you take it off the dealer lot. If you default on the loan, the bank is stuck with a vehicle that is worth less than what the balance of the loan is. Straight Forward – Usually, every element of the deal, lease price, term, money factor, residual, vehicle make and model is already in place and cannot be changed. This way you know you are getting a good deal. Financially Savvy – Why not lease a well equipped (not fully equipped) Ford Focus or something cheap for your daily driver and buy the used SUV or Minivan that you drive occasionally. Going this route might save you up to two hundred dollars on the new car which you can use to buy the used car. Piece Of Mind – How many times have you been driving around in your old beat up clunker and something broke. Your car repairs cost over $1k and it puts you in debt. It’s a never-ending cycle with cars. Sure, car companies are making better cars, but they are man-made. They will break down no matter if it is a Mercedes, Lexus, or a Ford. Cars and trucks are liabilities. They will depreciate. When you lease your car you will not have to worry how much it is going to be worth at the end of your contract. Yes, you are paying the depreciation of the car but who cares? In most cases you are going from point A to point B.
Wouldn’t it be nice to know you have one monthly payment you can budget around instead of spending thousands of dollars to buy something used? And then knowing you will more than likely be putting money in repairs over the years. Some people like to buy 10 year old cars, drive them for 2 years, and repeat. This is a sneaky play if you buy reliable cars and do not beat up on them. You also have to not mind driving ten year old cars. This saves you thousands of dollars. Some like buying 3 year old cars and driving them 5 years. Which is also a decent play except for the initial up front cost. But with leasing there are no surprises. You know what your payment is every month and how many miles a year you can drive. If you choose the right car, the advantages of leasing might make more sense than buying. Great car leasing article and one worth revisiting as time goes on and the recession moves from stage to stage. 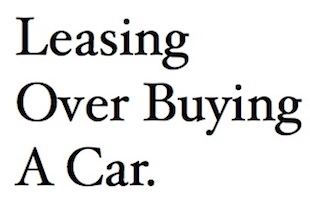 In the UK we have seen a huge increase in people leasing cars. They no longer wish to put them selves in debt with their lease cars as they no longer have job security to take on big car loans. Instead they are taking car leasing as an option and simply paying the depreciation on the car and enjoying the benefits of driving the newest and latest lease cars.